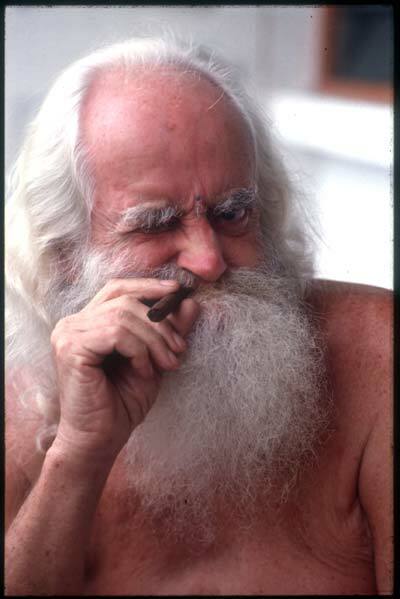 With the passing away of German Swami, alias Swami Gauribala in legend, both charismatic and eventful, spanning nearly half a century of retirement in caves and hermitages; ordination as a Buddhist monk; fire walking and Pada Yatra from Jaffna to Kataragama, and also as much welcome figure in the social circuit of posh Colombo homes and star-class hotels. I first met this enigmatic character in the early fifties, bathing in the Menik Ganga at Kataragama. In those days, this shrine was a desolate place most of the year round with the ten-mile approach only a cart-track from Tissa, untarred, rutty and dusty. Crowds thronged only during the July festival the majority of them Tamils from the estates and the North, who had to foot this stretch as there were no buses like today. So, a white skin in just a loincloth, with a few dark-skinned locals in the river during the off – season stood out prominently enough to catch my immediate attention. Discreet inquiries told me that he was known there as German Swami, and trailing him afterwards to his lair, which was then called Markandu Madam, near the Valli Amma temple-now no more, demolished years back by misguided politicians in a frenzied drive to make holy places ‘sacred' – I was able to make his acquaintance. This fist meeting lasted five hours. Seated cross-legged on bare floor, facing him, enveloped in the haze of a Jaffna cigar, ("my chemical weapon to keep unwanted visitors and vermin away" as he used to quip). Strangely no personal date was exchanged on this occasion although the conversation included many diverse topics like the arcane significance of Kataragama, its history, said to be dating from the Lemurian civilisation, other religions etc., unrehearsed questions posed and answers received with emotive eloquence. 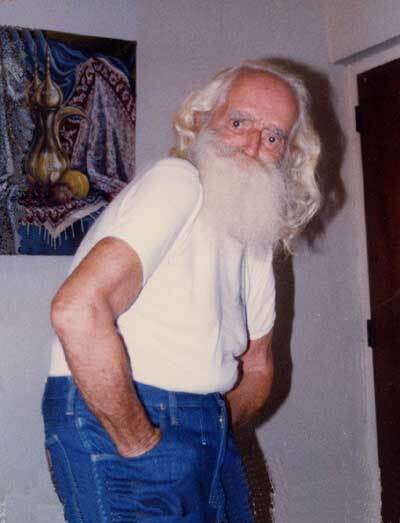 Later this chance encounter grew into a close relationship with an introduction he gave me to his guru, the great seer and sage of the North - the late Śrī Yogaswami of Jaffna, and, as time went by I was able to glean more information about this protean personality. Born as Peter Schoenfeldt to an affluent upper middle-class family with influential connections in the German government, faint and incoherent stirrings arose in his breast when he chanced to read Somerset Maugham's Razor's Edge in his twenties. Soon afterwards, Hetman Hesse's Siddhartha and Journey to the East clinched the matter, pulling him to India with his brother, Malte. After roaming there for sometime, meeting many holy men, swamis, fakirs and gurus, he found no satisfying solace to the confusion and conflict within, and the next inevitable stop was Ceylon mentioned in one of Hesse's books. Here he felt the influence of Theravada Buddhism under the tutelage of the German monk, Ven. Ñanatiloka at the island Hermitage, Polagasduwa in Dodanduwa. With the second war breaking out in the forties, all the German nationals were interned here, and soon sent across to India where young Schoenfeldt ended up in a camp at Dehra Dun with Heinrich Harrer of "Seven Years in Tibet" fame, Aufschneidter and others. Here the irrepressible Peter made a feeble attempt to escape to Tibet, only to be arrested and brought back. With the war ending, the two brothers found themselves in Ceylon once more, both to be ordained as Buddhist monks by Nyanatiloka, who was back at Dodanduwa. Before long both felt that this form of Buddhism was not this calling. Swami often told me that Southern Buddhism was somewhat like Protestantism in Christianity born out of argument, debate and dissent as the Sanskrit root, ‘vāda' implied. To many it was all polemics and dialectics satisfying an intellect bet on academics and scholarship rather than the ‘heart'. Eventually both gave up robes – Malte to join the diplomatic corps of their embassy in Colombo and to make Sri Lanka his home even after retirement until his demise in September '89. Peter continued his quest to quench the fires burning inside him by turning towards Hinduism. This took him to India many more times, meeting Sri Aurobindo at Pondicherry, Ramana Maharshi at Tiruvannamalai and other similar personages. 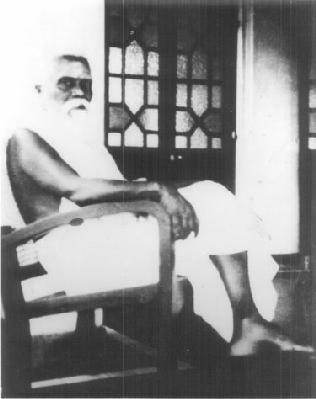 During this formative and fermentative period of his life he did intense tapasa (austerities) and meditation on his return to Lanka, living in Ravana's cave in Ella, and in the vanam (forest) at Queensberry Estate, Kotmale, where the famous saint from South India, Navanada Siddha once lived. With many years of this life of austerity and asceticism behind him, Peter was still a disappointed seeker – and one day he stood at the Jaffna railway station, waiting for the train, deciding to go back to Europe leaving the East for good. At this crucial moment destiny had other plans for him. A stranger in a verti, seeing a foreigner in the ochre-robe of a sannyasin accosted him. Hearing his tale of frustration and impatience to leave, this Tamil stranger quietly asked him whether he has met Yogaswami of Collumbuthurai, to which Peter replied that all swamis are rogues and humbugs, and he didn't want anymore of them! The stranger smiled benignly and said, ‘Yes, you are right. But Yogaswami is the greatest humbug of them all –and you must see him before you depart. You have to!" This intriguing and absurd statement rattled German Swami as this was the first time that he heard a holy man being called a humbug and someone who should be seen at all costs! The Colombo-bound train pulled into the platform and left with the stranger and Peter was still standing there in deep thought. Straightaway he shaded for Collumbuthurai … there in a little hut he saw a burly, bearded man who yelled at him the instant he was seen. "Who are you?" Yogaswami roared, "There's nothing for here!" German Swami who used to be always eagerly welcomed by oriental sadhus keen on collecting foreign disciples, was dumbfounded, and he was literally kicked out with the next verbal assault, "Get out!" Undeterred by this unusual and unceremonial beginning, he came again and again, pulled by an invisible force, to see Yogaswami. Undaunted, and thus began a strange relationship between a guru and a disciple which completely changed Schoenfeldt's life until his death in Sri Lanka. He told me that one day Yogaswami ordered him to discard the yellow-robe which Swami called the ‘uniform' and asked him to wear a simple white cloth like anybody else, and to be always a ‘NOBODY'! And these frequent encounters mostly took the form of strictures, admonitions, expletives and harsh words, rather than any formal teaching – always barbs to penetrate and shatter the hard, encrusted German ego interspersed only occasionally with a few direct pointers and guidelines showing him the path he had to follow. In 1956 a significant event took place in German Swami's life with the arrival of the then Governor-General Lord Soulbury's son, the Hon., James Ramsbotham at Kataragama, who had come all the way to see him, having heard of him abroad. This meeting also resulted in some changes in the life of Lord Soulbury's son, who opted to live at Kataragama Appaswamy Madam for sometime, donning a white cloth, foregoing the comfort of Queen's House, much to the bafflement of his august father. 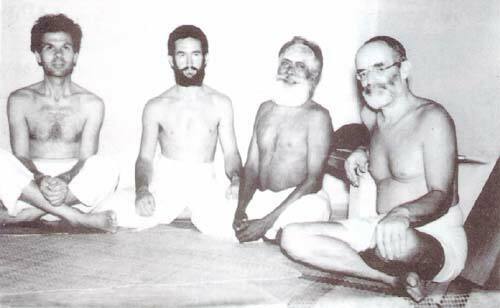 Archival 1960 photo of German Swami Gauribala (at right) with followers including Sandaswami (Lord Soubury's son, far left) and Narikutti Swami of Australia. This is where I made his acquaintance, as I often called there, s staying for long periods at a time, listening to, and joining in their discourses and conversations. It was at this stage that German Swami introduced Ramsbotham and me to Yogaswami in Jaffna – a confrontation which made a significant change in our lives. Soon the venue shifted from Kataragama to Sella Sannidhi temple premises at Thondaimanaru in the North, with Soulbury Swami (as he was now called by the folks at Kataragama) building an ashram for Gauribala (as German Swami was known to his close associates) and another, Queen's Cottage' for the Governor General's son. The third was for visitors like me who went up often to see Yogaswami and these two. When Yogaswami enjoined German Swami to be a "Mr. Nobody' he was also asked to take the name of Gauribala (child of the world-mother, the energy creatrix behind all noumena and phenomena). Gauribala later told me that this was an indication Yogaswami gave him to move towards Mahayana, tantra and esoteric Christianity in the role of a Shakta. Some years later Yogaswami separated these two each to go his own way, admonishing Gauribala for clinging on to Soulbury, thus impending each other's progress. Consequently Soulbury shifted to Jaffna town to be closer to Yogaswami and German Swami remained at Thondaimanaru. ‘Villa Berlin' was renamed, Summāsthān - the place of living summā moment to moment in the ‘Eternal now, aspiring ‘to be a Mr. Nobody'! This fiat to be summā is a paradox, difficult to unravel and comprehend often misunderstood as state of indolence and doing nothing. The nearest Yogaswami came to in explaining its mystery to both of us one day was when he was said, "Trying to be summa is not correct, and not trying to be Summa is also wrong! "… And then, "Die to yourself and find IT!" He advised us to work out the conundrum ourselves according to our own capacity and capability, stressing the need ‘to die' to one's conditioned self to be ‘reborn' - often pointing to German Swami and hinting that he was fenced in by extensive scholarship. Most of Swami's meetings with his guru were brief, with little or nothing imparted by way of knowledge. But Gauribala believed that much passed on to him unsaid – a sort of silent dialogue prompting him answers from within to many perplexing questions, lending direction to his life. 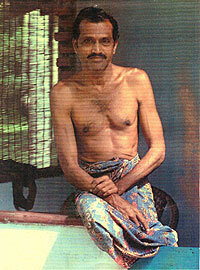 The life-style of Gauribala in Jaffna soon earned him a Bohemian reputation, openly criticized and condemned by many orthodox Hindus, but he carried on regardless like a true Shakta, being himself an inseparable part of the energy- force of what constitutes the Universe- rejecting northing, and ‘doing' what his heart urged him to do, moment to moment, deaf and blind to the opinion of others. Altars and immolations were not for him anymore. The sense of existence and motion was enough joy, purpose and fulfillment… innocent of regret and complaint as long as one felt, identified with, and experienced the intimacy of the grand conveyor-belt of power, energizing all life. Visitors were often surprised when he offered them Courvoisier Cognac a stock he had in his dingy cupboard, gifts from Colombo admirers. When this was not available, he walked in and evening to an illicit booth, not far from the temple, for what he termed, ‘my palmyrah elixir!" There, seated, sometimes on a mat, he regaled us with spiritual yarns from an inexhaustible repertoire, lavishly spiced with naughty, ribald metaphors and anecdotes. We dubbed this cadjaned rendezvous, 'Swami's 21st Century Club' of the holy spirit!" At a get-together in Kollupitya once, I was told he had to be carried into the car apparently quite drunk, but whether this was only a show of inebriation put on to shock others and to shatter their images of ‘holiness' woven around him, is debatable as a few of his close associates knew how clever Swami was in play-acting such games, simulating various roles on the spur of the moment to suit the occasion. In another incident German Swami came unannounced to Colombo and sneaked into one of Mahen Vaithianathan's lavish New Year's Eve parties undetected, disguised as a vagabond, wearing a pair of denims and banian borrowed from Manik Sandrasagra especially for the occasion. First he 'stole' food and drink from the kitchen and then mingled with the young lady guests with wine glass in hand, until he had stolen the party itself with an unbroken string of spirited jokes, limericks and bawdy songs -- all to the hosts's unmitigated annoyance! During one period of his colorful life, he sported an earring on the left proclaiming to everyone that his mother was a fey woman hailing from a line of gypsies, and that he was honoring her memory for the wayward, iconoclastic, restless genes she gave him! And all believed him not knowing that he was only displaying the dualistic, androgynous nature of man in conformity with the Hindu concept of Divinity as Ardhvrana Iswara. These frequent truant from monastic retreats, some interpreted as belated fulfillments of self-denial of those luxuries he left behind by departing from the West, early in life, in quest of spiritual knowledge. Gauribala was a deeply religious person in spite of his spirituous adventures and unconventional modes of conduct. 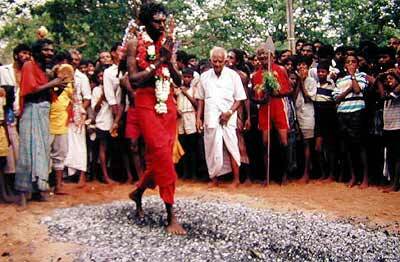 For many years on end he walked to Kataragama from Jaffna to perform the ritualistic fire-walking. To him religion was an intimate, personal affair a secret love with the unknown, hidden from others, and masked painstakingly from public scrutiny and assessment. "Deeply religious people have no religion!" was one of his oft repeated cracks, and no wonder eyebrows went up when none could fit him into what an ochre clad monk should do. There were no set aside times or techniques for meditation as such as meditation was commonly understood. He once told me that his whole life is one meditation, everything a Vipassana, a way of constant mindfulness, of full awareness of selfhood, and all was holy and sacred in his eyes. Intellectual company stimulated him, and numerous were his intellectual pursuits. One specially, Sigiriya research occupied a prime place in his lifetime. He was obsessed with the idea that he had been a general in King Kassappa's army in the dim past, and he made frequent visits to the rock, sometimes spending nights alone atop. According to Swami Sigiriya could have also come from the word ‘SIHINAYA' indicating recollection or dreaming in addition to its other connotations. Like the Dream-Rock of the Australian aborigines, he called it the ‘Rock of Re-Membering' or ‘Rock of Remembrance'. He collated comparative evidence from many traditions in support of this. A wise circle of friends from overseas came to see Gauribala at Thondaimanaru, most of them seeking answers to their personal problems, some adrift aimlessly, bewilded by what is happening in the world of today; others confused by the different offerings given by equally widely varying religious and tradition - all of them professing to have and own the ‘Truth', dividing people rather than uniting them. Nearly everyone, anchor less as they sailed along life. A few intellectuals also came to pit their knowledge with his, blown-up by their erudite egos, and it was good fun to see Gauribala tearing them apart with mordant humour! Being well-versed in almost all sacred traditions both occidental and oriental, he gave them all something to think about for the rest of their lives true to what Yogaswami once declared about him - that Gauribala will be a ‘signpost' for many in the Path. In the end during his last moments, a friend and devotee from Australia – Rose Collingwood - was at the mat side to close his eyes to this world, and according to her, Swami's final words were "Umma , Umma, Umma", a supplication (and perhaps also thanks) to the mother-energy of the Universe, to whom he was so fondly devoted - bringing the curtain down on the legend of a sadhu whom only a few understood. He was a lone warrior, walking the 'razor's edge' of his own contradictory conduct, whereabouts of his inner nature unknown, cleverly playing the role of a 'humbug' like his guru, "the Greatest Humbug of them all!"